It seems like everyone I meet was diagnosed with ADHD as an adult. I was actually diagnosed in the 90’s. So I’ve had knowledge of my diagnosis for a long time. But I didn’t always acknowledge that I had ADHD. In fact, I only really accepted it after looking back at my personal history and behavior with a therapist. This is written based on my point of view and is my ADHD story. It’s important to give a voice to our stories so we all feel less alone. I truly believe that if I got my voice back, so can you. Sitting in church I would tap my toes, trying to listen to the sermon. I went to a Lutheran church and no matter how much I protested, I was dragged there each week from the age of 4. In church my mind would wander, the nervous energy generated by this made me bite my fingernails and the inside of my cheeks. Every little hangnail, or piece of rough skin on my lips was totally distracting. Listening to adults speak or give directions was painfully boring. And the little Sunday School crafts – forget about it! I remember the first time I zoned out in school. It was second grade and we were working on long division. There were practice problems, and I went through the motions and wrote all of the numbers down. I never asked for help in school again. When I got home and looked at my homework, I drew a blank. Looking at those pages of notes felt like trying to read Chinese. My mind was like one of those empty speech bubbles hanging above my head. I knew that sort of blank space in my memory could not be normal and it started to affect my confidence. Keeping a planner for assignments and a locker for my stuff was a whole new level of responsibility in middle school. My mother took me to a Psychologist to get my diagnosis. My stepfather died in September of the same year. I am not sure if I would have been diagnosed had I not been shuttled to a psychologist immediately after his death. My memories of the testing process are hazy, but the child psychiatrist who did it was amazing and is still in practice today. I went from hanging with my friends and living in middle school obscurity to being a special case in need of monitoring. Every day I went to the guidance office during lunch for learning support, even though I had not tested with any specific learning disability. The nurse gave me my second dose of Ritalin at lunch as well. I found the whole experience humiliating. I was keenly aware that the reason I was doing all of this was to make my mother feel better. Everyone wanted me to perform better in school. Nobody seemed to care about how I was feeling. I took an anti-depressant called Desipramine, along with immediate release Ritalin. Over several years I trialed multiple anti-depressants until I finally weaned myself off of them in college. Through words (and actions) I was informed that I would take my medications and do what I was told because I was not capable of thinking for myself. I was deemed incapable to even speak my own mind. All control over my life was taken from me at once, and I started to feel angry and trapped. When I attempted to speak openly with my therapist about family issues, I was dismissed. The trouble with all of this was that I became very ashamed of just being ME. I believed that I had something terribly, shamefully, wrong with me. I allowed the diagnosis and the adults around me to take my voice. I went off to college immediately after graduating from high school. This was a time of tremendous personal growth and tremendous confusion for me. I joined a sorority, and drank copious amounts of cheap beer. I skipped classes, and I made bad decisions about men. Yes, I had trouble focusing on the academic stuff. But I also learned that I did not need medication all the time. I could take it when I needed it, and put it in my underwear drawer when I did not. It didn’t matter that I was a mediocre student. I was free to just succeed or fail or drink beer or whatever without anyone telling me I was doing something wrong. In my early twenties I moved to Philadelphia. Living in the city was the first time I started to take care of my mind and body. I worked with a therapist and started to exercise and actually think about what I was eating. It was a revelation to me that I was competent to control my own physical and mental health. I lived on my own for three years and supported myself. I had proof I could make it on my own. Until all of my compensatory strategies went out the window and I walked out of my first post-college job without giving notice. Unsurprisingly, this coincided with my decision to stop taking Ritalin. After my failed first career, I moved home and took paralegal certification courses. I never even finished the certification, but I managed to get a job at a firm in my hometown. The great thing about this type of work is that there is a rhythm to how you maintenance files, and the steps of the process are the same for all of your clients. The bad thing about this type of work is that it breeds boredom. The ADHD brain craves novelty. And living in my hometown forced me to face some of my old demons. During this time my anxiety started to impact me more than it had previously. I now know that it probably happened because I was no longer taking my ADHD medication. Avoiding any kind of intimacy was my specialty. I went on several dates with nice men and then could not bring myself to return their calls. My feelings of insecurity took over so I would reject them before they could reject me. In 2003 I met my now husband. We both volunteered with the same organization, but I didn’t really see him as a potential at first. The Hubs was older and shorter than my prior love interests, and he had been divorced. It took two years for me to feel comfortable enough in my own skin to have any sort of relationship. I cannot recall how I told him about my ADHD. Maybe he just figured it out? Or maybe it was when he helped me move out of my apartment and he got to really see, in living color, my disorganization and executive function issues? The Hubs can do math, remember dates, organize a room, and manage filing cabinets of important documents. He has always been completely tolerant of my disorganization and various neurosis. We were married in 2008, the year I turned 29. As I contemplated my career path I had a hard time coming up with any usable skills I could offer. I just knew I wanted to do something that impacted the lives of others. The only thing I have ever been marginally good at is writing. I also do well with research. After much thinking, I decided that I enjoyed young people and literature/writing and I wanted to teach. Since PA has excellent state schools with teaching programs I enrolled in the one nearest to my home, and then transferred my credits. College at age 29 is very different than age 18. Suddenly I became a perfectionist. Every test I took and every paper I wrote had to be perfect. Who would have thought someone with my brand of ADHD could ever spend 5+ hours per day studying? Hyperfocus much? Then I got pregnant. Because….why not? My ADHD caused me to miss out on many of the milestones of my son’s first year. He screamed a lot, so my senses were sort of overloaded between that and my regular anxiety. I actually paid a babysitter so I could take an ESL course at night. And I often left my baby with my husband so I could sit in a coffee shop and work. As a person with ADHD I could not handle the pressures of motherhood and school on my own, I needed help. Getting through that first year really did take a village. As much as I regret my inability to handle everything when he was tiny I needed support. My hormones were out of whack, and my ADHD was worse than ever. One afternoon while nursing I looked down at my baby and decided that I wanted to be a better mother and partner, so it was time to deal with the ADHD elephant in the room. In the spring of 2015 I woke up one morning and decided that because I couldn’t find the kind of ADHD support group I wanted, I would create my own. My therapist seemed to think it was a fine idea. I wanted a community, support groups, and high quality information. But I wanted it to be fun and positive as well. This website started out as a personal blog of sorts and has morphed into a supportive community of women that I am so proud of. Growing the community and attending conferences has energized me to keep going. I love the women I have met and worked with and I am constantly looking for ways to better serve ADHD women. Telling my story is therapeutic, but I also hope that it shows people it’s ok to be honest. So many of us hide and feel ashamed of the ADHD label. Join us over in Coaching Corner. Learn about the emotional impact of ADHD. Lets create a community of dynamic, fun and supportive women that totally “get” each other. I always say we are stronger together. 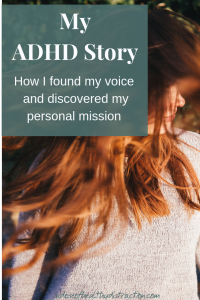 Do you have an ADHD story? I would love to hear it.